Emergency Response and Disaster Management are different domains of activity with different information sharing requirements. They do, however, overlap and and in both domains there is a need to rapidly discover, share, integrate and apply geospatial information. The standards work of the Open Geospatial Consortium (OGC) plays a key role in addressing this need. Speeding the flow of location information means more lives and property saved and less risk for first responders. The OGC's geospatial standards enable interoperability among and between systems used by organizations operating in different jurisdictions, knowledge networks and domains of activity. Systems that implement OGC standards reduce the time required to find, analyze and update crucial information. Legacy systems can continue to be used in a network of increasingly heterogeneous systems. Purchases of new OGC-compliant systems bring less risk of obsolescence and vendor lock-in than purchases of non-compliant systems. Best-of-breed systems for niche applications can be counted on to plug-and-play with any other OGC-compliant system in the local/regional/national/global information network. The net result of open standards is that Emergency Response and Disaster Management stakeholders have more information available to them before, during and after an emergency or disaster occurs. Standards enable adaptability. Just as IP-based communications enable many different kinds of systems to talk to each other, systems based on OGC standards enable many different kinds of systems to exchange location information. In seconds, imagery and vector data, or hazards data and route data, can be "fused" into operational maps. Real progress is being made in standards for indoor location and indoor/outdoor location integration. Dispatchers, disaster managers and field personnel can contribute information on the fly to maintain an up-to-date and increasingly rich common operating picture. The data can simultaneously be presented in different map styles for different communities. Much work remains, however. The Emergency Response and Disaster Management communities need better representation in OGC working groups to ensure that their requirements are addressed in ongoing standards development. Geosemantics – Studying approaches to shared understanding, semantic mediation between communities that use different location names, map symbols, etc. Geo Rights Management – Developing technical supports for quickly releasing, accessing and sharing information and minimizing discussions over ownership, access rights, etc. Mass Market – Exploring the emerging geospatial standards needs of Web mapping, location services for mobile devices, Web 2.0 applications for social networking and collaboration, mashups, remixing etc., often with a focus on simplicity versus comprehensiveness and flexibility. Open GeoSMS – Location information can now easily be integrated with the existing widely used SMS short messaging service, supporting ER and DM applications such as Sahana, Ushahidi etc. Sensor Web Enablement (SWE) – SWE standards help EM/DM stakeholders publish, discover, assess, access and use networked sensors of all types, including webcams, to provide real-time information about events on the ground, helping with situational awareness, common operational picture, etc. Workflow – Supporting the need in ER/DM and other domains to automate and orchestrate activities and services that turn geospatial data into useable information. OGC’s Interoperability Initiatives – testbeds, pilot projects and interoperability experiments – often feature disaster scenarios. The OGC's first and second testbeds (in 1999 and 2000) focused on web mapping. In the third OGC Web Services testbed activity (OWS-3) a team of experts from OGC member companies demonstrated which geospatial information system interoperability capabilities were necessary, available and yet to be provided in a fictional scenario involving a forest fire approaching a warehouse full of toxic chemicals in a heavily populated area. Live aerial imaging, first responders with cell phones, GPS and video cameras, and multiple decision support systems were involved in giving all parties improved awareness and information for planning and coordination. The scenarios for OWS-4, 5, and 6 also addressed disasters. OWS-6 involved interoperability between a building information model (BIM), an indoor navigation system, IEEE 1451 sensors, wireless communications, live imaging from an unmanned aerial vehicle, maps and modeling and simulation tools, all of which are documented in OGC Public Engineering Reports. In the scenario, this interoperability resulted in lives saved and property protected. In OWS-7, participants advanced technologies to share spatial information between military and NGOs in a multi-national relief effort. Participants addressed spatial data sharing, synchronization, and data reliability. Threads in the current OWS-8 testbed include: observation fusion, geosynchronization, cross-community interoperability (semantics and map styling), and aviation. OWS-9 scenarios involved aviation information systems, cross-community interoperability, security and services interoperability and OGC Web Services innovations of various kinds. The OWS-10 marine oil spill and fire scenario advanced work in semantics, conflation, data provenance, linked data, field annotations the new GeoPackage "universal data format". are developing a new set of requirements that will build on work done in the previous OGC testbeds. Videos of some of the OGC Web Services Testbeds can be found at http://www.opengeospatial.org/resource/demos. Government: national, regional and local agencies and organizations with mandates to manage risks and crises. Private sector: software vendors; planning, civil engineering and construction companies; system integrators and data providers. Academia: research groups and advisory councils that serve decision-makers at all levels. Non-governmental organizations (NGOs), such as the World Bank Institute and the IJIS (Integrated Justice Information Systems) Institute. Learn more about OGC members on our Members page, and learn about the special national and regional forums that members have organized around the world. OGC standards are only part of the mix of standards needed for making risk and crisis management systems more interoperable. The OGC works with many of the world's leading information technology standards organizations to be sure our standards work well with theirs and to avoid duplication of effort. The OGC collaborates with other standards organizations such as OASIS and IETF to insure that location payloads are consistent. This eases the pain of moving location data through entire workflows. are associations of organizations whose requirements are similar to the requirements of Public safety, Justice and Disaster Management. The OGC works with these partners on activities such as outreach, education and bringing sponsors into OGC Interoperability Initiatives to share costs and pool requirements. The Emergency & Disaster Management Domain Working Group provides a forum for uniting communities of users including government agencies, industry, research organizations, non-governmental organizations and others with various roles in Public safety, Justice and Disaster Management. This working group actively promotes dialog, collaboration and innovation concerning interoperability and standards harmonization within this community. The OGC’s SWE standards are key components in building distributed sensor networks for monitoring and protecting critical infrastructure such as buildings, airports, railways, bridges, utilities, and water supplies. Such networks also play a role in tsunami and earthquake warning systems, severe weather forecasting and tracking, flood warnings, and environmental health. The OGC Standards Program provides an effective and well-trusted industry consensus process to plan, review and officially adopt OGC standards for interfaces, encodings and protocols that enable interoperable geoprocessing services, data, and applications. The Standards Program allows members from government, research and industry segments worldwide to do this work together in a collaborative and collegial environment. Sahana also works with the OGC's Open GeoSMS standard, which defines a short messaging service (SMS) encoding to exchange lightweight location information between different mobile applications. GeoSMS is compatible with other OGC standards, such as those for sensor webs and earth imaging, and it is also compatible with standards such as the OASIS Common Alerting Protocol (CAP) standard. The OGC works with many other standards development organizations to make geospatial information and services an integral and fluid part of the world’s information infrastructure. Immediately after the 2010 earthquake in Haiti, government agencies, commercial providers and NGOs were able to make information available for immediate and widespread use because their products and services implemented OGC web services standards. In Chinese Taipei, massive flows of rock, soil and water in populated valleys pose a major threat. OGC standards play an important role, along with other standards, in connecting advanced monitoring instruments to systems that also receive and broadcast citizen-originated warnings about imminent or in-progress debris flows. 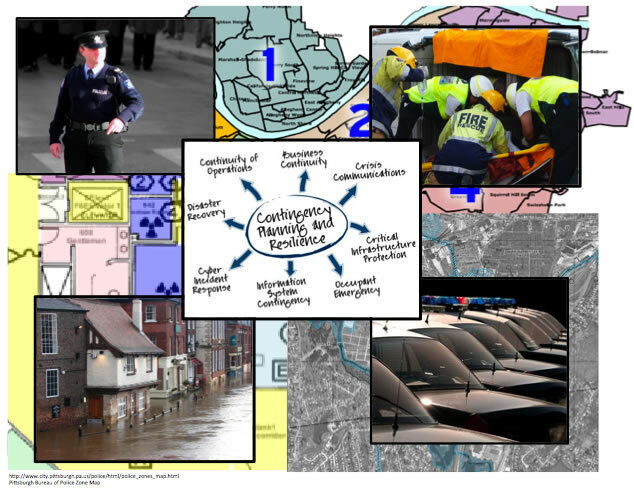 The OGC is involved in emergency response and disaster management standards efforts to help solve critical real world communication problems in these domains. Major software vendors, solution providers and government members in the OGC consensus process are working to accelerate the development and adoption of these standards. The OGC has demonstrated its ability to rapidly develop, test and validate standards that meet real world business requirements and work well with other standards. The OGC® is an international industry consortium of more than 500 companies, government agencies, research organizations, and universities participating in a consensus process to develop publicly available interface standards. Visit the OGC website at http://www.opengeospatial.org/contact.